How to detect and change Browser user agent? 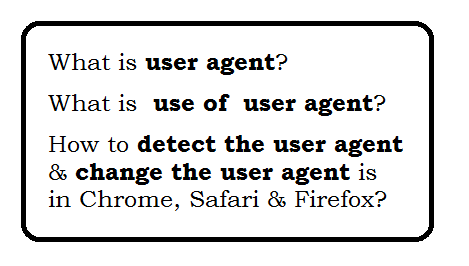 Question: What is Browser user agent? It is software agent which acting on behalf of a user. Actually it s user agent is a Single line of string which helps to detect the request. When an request is sent to web server then user agent of browser is also sent in header which helps the web server to identifying the browser and operating system. Question: What is use of Browser user agent? It helps the web server to identifying the browser and operating system. Means with the help of user agent, web server can get the know which browser of OS is request the data. Web site uses this customize content for the capabilities of a particular device. Question: Who is using of Browser user agent? Web Server (Websites) are using the user agent. With the help of user agent they get to know mobile OR Desktop. then web server sent back the data as per requested device. Question: How user agent is sent to Server? When an browser send request to web server. then request header is sent to web server along with request data. Question: What is my current user agent ? Question: How to detect Browser user agent? with use of user agent string, you can detect the browser and OS. Open: http://www.useragentstring.com/ Add the user agent string and click on Analyse. Question: Can we change Browser user agent? If Yes, How? Yes, We can change the user agent. With help of User-Agent Spoofing, We can change the user agent. Question: What is User agent spoofing? Spoofing means behave differently than in actuality. Question: Who is User agent spoofing? Spam bots, Web scrapers, hackers uses the spoofing to hide their identity. Question: How to change the useragent in Chrome, Safari & Firefox?